The teachers in Punjab have made much stir in the government circles with their protest on mall road in front of Punjab assembly before the holy month. They were assured that government will halt the privatization of schools and after the holy month, a committee would be formed to address the issues. The teachers still doubt the intentions of government and their reservation became reality, when some days before government announced to handover some public schools to Danish school authority. They have threatened for strong protest after this month. ome teaching circles have also raised their voice for the scale up gradation on which the government is completely silent. Now! All the teachers who were supposed to get the promotion from grade 17 to grade 18 have knocked the door of Punjab high court and request the chief justice to give directions to education department for the issuance of notification. The affected SSTs are waiting for their promotion from last three years as they said that their link training for the promotion has been completed and the promotion committee of the education department has also given the approval of their names but till now, there is no progress on the issue. Total 282 teachers have been completed the training and waiting for the promotion to grade 18 after the promotion board’s green signal. They are saying that despite the clear approval of the promotion board and the completion of link up training, the secretary education is not issuing the notification. They said that it is clearly written in the promotion policy that you have to complete 5 year of service in grade 17 to be selected for promotion to grade 18 but even with the work experience of more than 7 years in grade 17, they have not given the promotion. The case is strong in favor of teachers and their demand is absolutely right and according to the rules and regulations. It has become the trend in our bureaucracy to delay the matters as possible as they can. In case, the high court gives the ruling in favor of teachers and department has to give them promotion, what will be the credibility of the department? Either they are not serious in their work or they don’t want teachers to be promoted. The chief minister has to take notice of this slow motion attitude of education officials. 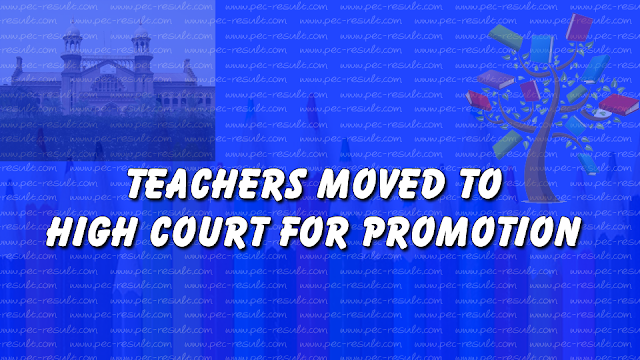 Instead, the promotion must be automatically given to teachers after the completion of required work without the approval of secretary schools. On the next hearing, the stance of the education department will determine the future of this matter.